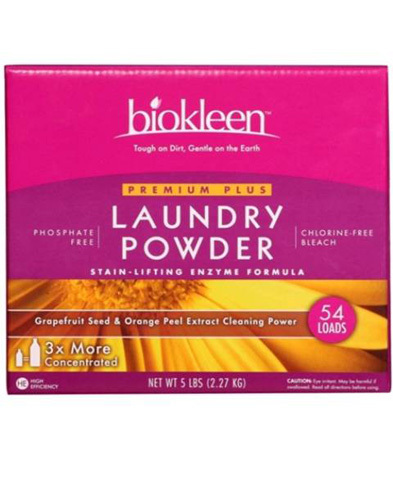 Our Premium Plus Laundry Powder contains Stain-Lifting Enzymes, and like all biokleen products is clear of dyes and brightners. Removes the toughest dirt, grease, stains and odors, yet is gentle enough for cloth diapers, delicate fabrics and hand washables. Rinses clean leaving no residues on clothes that can irritate skin or ruin fabrics. Safely whitens and brightens with natural Oxygen Bleach, Grapefruit Seed and Orange Peel Extract, Natural water conditioners, and natural protein digesters. A powerful laundry cleaner and deodorizer without added, harmful ingredients. Gentle and safe enough for you most delicate washables, including cloth diapers; leaves no irritating residue or odors behind. INGREDIENTS: Natural protein digesters from fermentations, Sodium Percarbonate (Oxygen Bleach), Soda Ash, Citrate, Surfactants frorm Coconut and/or Corn, Grapefruit Seed and Pulp Extracts, Orange Peel Extracts, Zeolites, Sodium Sulfate, Zeolites, Low pH Silicates, Chelators from Vegetable Filber.